We were excited to see the red telephone booths in London. This was almost a decade ago now, I wonder if they still have them? It'd be a pity to lose them, but would anyone really use them today? We were only using it to get pictures even way back then. There are very few phone booths here anymore. Funny how we used to have to pull over to make a call. Now everyone has cell phones. Yes, really fun, walk home! When I saw the photo of the phone booth, I wondered the same thing. So many things have gone the way of the buggy whip during my lifetime. 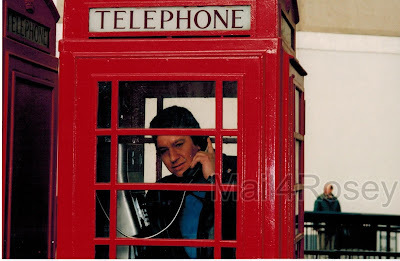 I remember seeing at least one of the phone booths in London when I was there in November. Being a tourist I was looking at everything! Phone booth? What's a phone booth? lol. Isn't it amazing how far technology has come....all in our lifetime. Great picture. Where will super heroes change clothes if all the phone booths disappear? If ever I see one, I plan to take pic. One day it will be like a record player and my kids will ask "Whats a telephone booth?" Thanks for sharing..
Oh man! What a classic. London is so on my list!!!! For my 40th Bday we are going to France....my girls are in a school program where they are learning French from 1st grade to 6th, so they get to translate for me as they should be fluent by then! I miss the good ole days...okay, now I am dating myself. Never actually been to London, but a total classic for sure and would love to know if they still exist!! They are hard to notice (American ones) unless you are looking for them. They still have them strategically placed on base. I just can't imagine a kid that has just joined the USMC that doesn't have a cellphone though. I wonder if they let them take them to bootcamp?? I can't even remember the last time I even saw a phone booth. It has been a long time since I've seen a telephone booth or even a public pay phone. great click. I don't think they have 'phone-booths' now. The red phone booths are so much better looking. I remember the glass ones. It really is a shame that they are gone. Sometimes one creation eliminates another. Thanks for the memory walk. I hope they still have them! Even if they don't use them, they are almost iconic in a way. I hope they still have them! If for nothing else, just for the photo ops! I'm kind of addicted to these phone booths. I have several pics of me in them when I was in London. I love these phone booths! I saw one in VA the other day, but it was empty. I think they're awesome! They only have a few left :) It seems that no where has phone booths anymore, much less pay phones. Our town only has a few pay phones, so if you don't have a cell phone you are out of luck! We still have a few but they're not as nice as the red ones in London that's for sure! Those red phone booths are so iconic. Maybe they could find some other use for them, at least in the touristy areas. There are still red phone booths - I don't know if people actually use them, I think they are more of a touristy thing these days! Love those red phone booths! They're so quintessentially London! Maybe they'll go into a museum or something. So cool! They have one of these in Epcot at Disney World and my boys LOVE going in it every time we go. I remember those red phone booths! We also had them in my country (although they were black) when I was really little. My hubs would love to have one of these! Well he would LOVE ME TO THE MOON AND BACK if I give him a replica of the Tardis!!!! LOL...every time I see one of these I think of Dr. Who! Cool looking thing! Good for you my husband had been hooked since he was a teen,...and that was IONS ago...he would rather starve than to miss one episode, lol..thank goodness for DVR! I love that! I used to work with a girl that was from there. She had a tea holder that was a red phone booth. She gave it to me when she moved. We have a Crosley red, white and black retro wall hanging phone in our kitchen. It seems like when anyone come to visit they ask about it. It has push buttons, but a fake dial up. You can put coins in there as well. One of Mica's friends came over one time and asked, "Do you guys charge for phone calls?" I told him we do. HA HA Then I told him the truth. My MIL has one of those phones. I think they're cool looking. Oh my ... what a blast from the past. We used to see those many, many years ago here in the US... I do mean many years ago. I love seeing those too, even the ones here. When I see one, I squeal! I don't even remember using one. By the time i was old enough, they stop using them.